Come join me!........ For anyone interested in photographing the Milky Way with some amazing backdrops including one of the nation's well-known icon's Mount Rainier, then please join me on this workshop as we visit one of my favorite playgrounds.....Mount Rainier National Park. 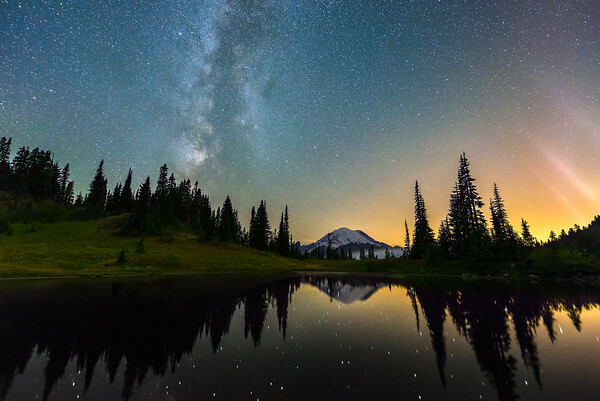 My workshop begins with a meeting in Bonney Lake, Washington in the afternoon as I take you through some basic techniques for post-processing night-time, astrophotography photos; a much needed skill to create the final, ultimate images that you seek to obtain. And if you bring a laptop, you will be able to process sample images right along with me. 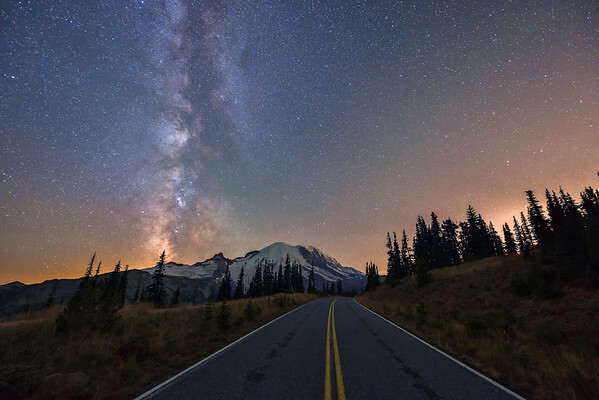 After our post-processing tutorial, we will head for Mount Rainier National Park in hopes to arrive in time to shoot sunset, and then take in twilight until the stars and Milky Way begin to appear! Then the shooting begins!!! Friday, July 21, 2017. Meet in Bonney Lake at 4:30pm, Shoot until 1am. - SOLD OUT! - Workshop is Full. Saturday, August 26, 2017. Meet in Bonney Lake at 3:30pm, Shoot until 12:00am. - SOLD OUT! - Workshop is Full. Number of Participants: 6 to 8 maximum in each workshop. Payment: email or message me on Facebook, and I will send you a link to pay by credit card via PayPal. Reservations are accepted first come, first serve when a full deposit is received for the workshop. Although we will not be hiking more than a mile from our parked cars, we will be at higher altitudes (5,500 to 7,000 ft) and hiking on hilly terrain in the dark with headlamps. The trails are not strenuous and we definitely take our time, but please know your limits, and please do not hesitate to ask me if you have any concerns. A DSLR or mirrorless camera (Full frame sensors are ideal and will achieve the best results). A low f-stop, wide-angle lens that can be manually focused. (I prefer to shoot with my f/2.8, 14-24mm on a full frame sensor, and will typically shoot at either 14mm or 24mm). Headlamp (preferably one that has a red light included to "save" your night vision). 2-4 fully charged batteries (and a battery charger just in case). One battery will probably not last the night. Remote Shutter Release to avoid camera shake (of course, the camera's self-timer will do the trick also). A soft lens cloth (or two) to wipe your lens in case of condensation. Bring 4 to 5 layers of clothes. I can not reiterate how cold it can get at 6,500 feet elevation at night! Cancellations will be accepted no later than 30 days before the workshop date. Within 30 days of workshop, no refund will be given of any kind. If you are unable to attend, you may find someone to fill your spot, however any monies exchanged must be solely between you and the other party.